McDonalds may be the most popular restaurant in the world. There are some variation in themes with Japan having a "Teriyaki Samurai Burger," Thailand adding a "Sweet Basil Chicken Sandwich," Indonesia dropping in a fire hot chicken plate and India eliminating beef and substituting lamb. 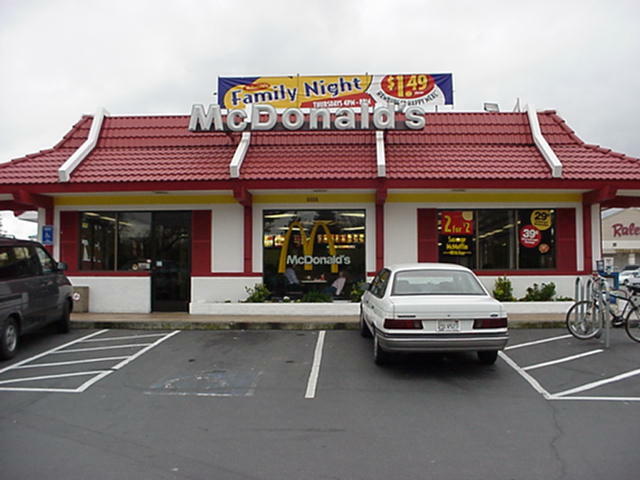 But the most wonderful aspect of McDonalds is that it is an oasis of familiar food anywhere a traveler may wonder. The quality in most of these restaurants is very similar. The question is, "Is that quality good enough for Americans?" Unfortunately, it is. Most ignorant Americans lack the culinary training afforded to Prof. Beef and Dr. Meat and just shovel these burgers down without any regard to taste and quality. Most Americans couldn't tell the difference between a sawdust sandwich, a Big Mac, and the twenty-nine cent special wrapped up at AM/PM. There is, my friends, a big difference among burgers in this world. The patty inside the Big&Tasty was a fried, preformed frozen disc. It was as dry as my sawdust sandwich and without any discernable seasoning and lacked any beef flavor. It acted as a filler inside the standard, generic, sesame seed Wonder-type bun that most any of us can buy at the local supermarket. The condiments were the standard white onion pieces, slice of tomato and whole leaf iceberg lettuce. The cheese on top of our "meat" was a thin slice of American. The fries, acclaimed by millions, were hot pencil thin, salty, skinless, white sticks. There was no potato flavor to this quickly prepared, oily side dish. And as soon as they cooled down, they were inedible. Almost everybody loves McDonalds fries, and they have become the industry standard. But, why? Next time, really taste these frozen bits and write us if there is any potato flavor at all. McDonald's was clean bright and fast. We ordered a big and Tasty with cheese, fries , and a soft drink. The soft drink was outstanding, it had just right amount of ice and the syrup to soda ratio was perfect. The fries were very hot, very salty, and absolutely no potato taste. In fact they can be described best as hot, salty, fat, vessels. The burger was a nice attempt at the American classic. Although the burger eaten all together was not offensive, it still lacked character. The patty was dry, and tasted like "mystery meat' not beef.